As Mikey types away on his novel, Casey interrupts him and states that he’s too worried about Leonardo to go to work. Mike tells his friend that April is going to be really angry as money is so tight, but Casey explains that maybe they’ll find the problem and be able to claim the reward. Mike agrees to accompany Jones and they head to the sewers, where they immediately find corpses of hunters. Leoardo awakens with his arm bandaged. King Komodo explains that he isn’t Lord Komodo, but rather his “half-brother”- a product of Mutagen experimentation. King Komodo reveals that Lord Komodo’s lead kunoichi, Pimiko, had captured and tortured him and then brought him to New York City to find the Turtles. Leo asks why King Komodo has involved Leatherhead, and the monster states that the gator was going to warn the Turtles of his presence (and Pimiko wants to blame Leatherhead for the killings and collect the reward being offered). Leo leaps to his feet and uses his blades to cut Leatherhead’s bindings. LH stands and thanks the Turtle for the help, and then he prepares to attack King Komodo. Oddly, Leatherhead finds himself unable to attack his captor – while he makes every effort to advance, his body will not obey his mind, and he stands frozen. Komodo tells his foes that he has the ability to dominate the minds of his “primitive brothers” – and unfortunately for LH, he falls into this category. King Komodo then tells Leatherhead that his true enemy is the Turtles. Leo coaches LH to fight the beast’s control, but unfortunately LH is too weak and he attacks Leo, knocking both of them into the sewer water. 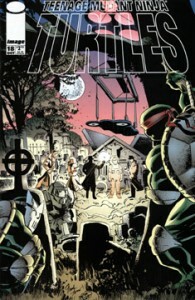 On the rooftops, Raph leads his Foot Soldiers on an exercise when his mausoleum alarm goes off. The Foot ask their new leader if they should answer the signal, but Raphael takes the alarm and crushes it in his hands, stating that his brother’s false alarms are no longer his problem – his place is with the Foot. Nearby, two Elite Guards and a shadowy figure spy on the group. Back in the sewers, Casey and Mike find the blood-drawn message from King Komodo and quickly track down the villain, who stands over the fighting forms of Leo and Leatherhead. Leonardo manages to suffocate the giant gator until he passes out, and then the turtle swims the unconscious gator back to the surface. As the pair surface, King Komodo aims a rifle at Leonardo – but before he can pull the trigger, Mike and Casey attack him from behind – knocking him into the murky waters. Leatherhead recovers from his near-drowning as Casey piles up the bodies of the dead komodo dragons. Mike states that he wasn’t able to find any sign of King Komodo, and Leo surmises that he’s not dead and they’ll have to watch their backs from now on. Casey offers to split the reward for the komodos with the Turtles if they’ll help him carry the bodies to the surface. Leo bemusedly states that he’s the one who killed the creatures – not Casey – so he’ll only do the split if it’s 75%-25%. Jones says, “Okay, I’ll take 75% if you insist.” Mike helps the pair carry the bodies to the street as Leo and Casey continue to argue.